On almost every diner breakfast menu in the United States you’ll find eggs florentine – a breakfast dish of poached eggs over wilted spinach sitting on half a toasted English muffin (we’ll get into the Englishness of English muffins at another time) and dressed with a hollandaise or bechamel sauce. What makes them Florentine or in the style of Florence, is the spinach, otherwise they’d be just poached eggs on toast or, perhaps, eggs benedict given the sauce. In Florence, and other parts of Tuscany, eggs florentine are not typically eaten at breakfast time, the Tuscans preferring the simplicity of coffee and a pastry or perhaps a grilled slice of saltless Tuscan bread, rubbed with garlic and olive oil. 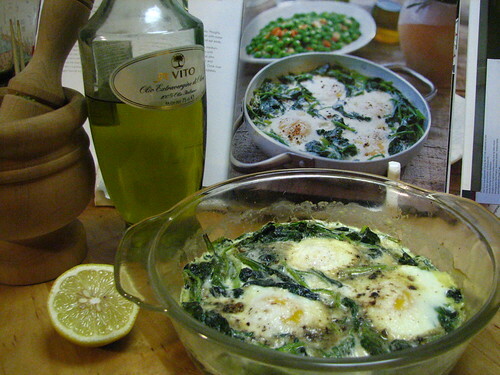 However, the basic notion of eggs and spinach is authentically Tuscan, and instead of poached eggs over wilted spinach, they are often baked together in a creamy, nutmeggy sauce and eaten as a side dish to a grilled or roasted meat. And, with a lot of things we do on our blog, we feel the authentic version is better than the knock-offs and happily spinach is in season right now, so it’s both authentic and seasonal. Initially, I was skeptical that this dish would be any good because spinach dishes are usually not that flavorful – with the spinach not offering much in the way of an identifiable taste. Not in this case though, where the spinach actually provides all the flavor and, surprisingly, a lot of almost crunchy texture, and the cream, eggs and butter provide the richness. This, as an accompaniment to a great, rare bistecca alla fiorentina, would make for a delicious and decadent dinner, not dissimilar to the traditional American steakhouse classic of steak with a side of creamed spinach, but the addition of the eggs to this dish really puts it over the edge. You really can’t go wrong. Pre-heat your oven to 350F / 175C.In a large saute pan, wilt the spinach gently in the butter. Three to four minutes is all it should really take.Then strain-off the spinach juices and reserve. Place spinach to a buttered oven-proof baking dish and distribute evenly.Add spinach juices and half the cream back in your pan and over low heat allow to reduce a little – until the cream is a pale green and starting to thicken. Then add nutmeg, salt and pepper to taste.Pour the rest of the cream over the spinach and make indentations in the spinach for your eggs. Crack eggs into indentations, then pour over the cream and spinach juice mixture before sprinkling the whole thing with parmesan cheese and some extra black pepper.Bake for 15-20 minutes or until bubbling and eggs are firm. Allow to come to room temperature before serving with your favorite cut of steak. Thanks to Maxine Clark, The Flavors of Tuscany: Recipes from the Heart of Italy, from which this recipe was adapted. One of my favorite all time brunch dishes. As always, you two give good background on a dish (please note other bloggers) and I’m hip with that. I noticed you kept the vibrant green of the spinach after cooking it and that’s hard…it usually turns a dark green. Any secret(s) you punks aren’t divulging? C’MON!!! Madonna Mia! Your uove look amazing! So much better than the Americanized version. This is a keeper! Gorgeous. I think with some nice crusty bread this would make an excellent light weeknight supper on its own – no steak required (not that I’d turn a steak down, mind you). I have to say this is such an inspiring blog!!! Looks lovely. love the way it looks all cooked up. I agree with Rachel – this would be fine on its own for dinner. so the spinach is really a delivery system for the cream, butter and eggs…. man. right now that sounds as decadent as pork belly. just beautiful and i could taste it with my eyes. Ooh, I would love this with steak. Creamed spinach does not do enough to capture my heart. Don’t believe I’ve seen the word “nutmeggy” before. Cute! I made something almost exactly like this for dinner last night, and it was delicious and soul-satisfying. 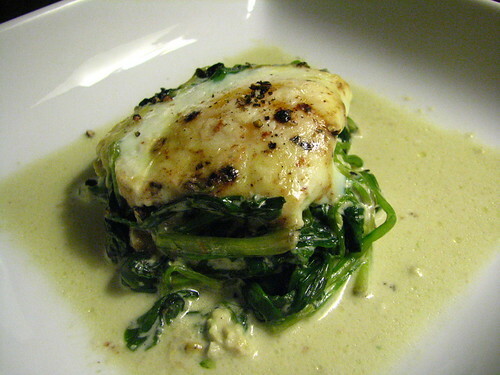 The cookbook where I got the recipe (The Good Egg) described it as her version of eggs Florentine. Little did I know that this is actually the more authentic version — also easier to make and tastier, in my opinion. Thanks for the bit of history! This recipe is a keeper. Thanks for the kind comments, as usual. Peter – interesting you should mention the green-ness. I’m not exactly sure why the spinach stayed so green. Could be it just looks that way because of the contrast with the egg, but it might also be because rather than leave all the green-ness in the pan when I removed the spinach, I reduced it with half the cream and added it back in to bake. I’m thinking that also accounts for the excellent spinach-y flavor too. But if it’s not that, then us punks are as much in the dark as the rest of you, sadly. Heather/Rachel – i ate this with some pollo alla diavola done under a brick, but the chicken was step too far and I could just have had the spinach and eggs with some crusty bread. Equally, I could have had less spinach and eggs, and eaten the chicken too, but you’re right, this would make a light dinner or indeed, an excellent vegetarian main course at a long lunch. Claudia – you saw right through this recipe. it is decadence disguised as a vegetable. I love this true version. And while I wouldn’t turn down eggs for breakfast, I’m a much bigger fan of them for lunch or dinner. Thanks for the beautiful recipe and photos! Delicious–I must say, I have only eaten the American diner version, but this doesn’t look hard. I just finished eating my tweaked version of your recipe – same recipe, but on an English muffin with Canadian bacon. Americanized for sure, but extremely tasty. Thanks for the recipe! Wow, yum! Spinach and eggs and nutmeg? You’ve won me over…be it for breakfast, lunch or dinner! hi wanf! i love this recipe. i think for months i’ve been stalking recipes for baked eggs. this might have sealed the deal i want to eat these so bad right now, beautiful! It is really great as a light lunch. I like the idea of adding cream and cheese to it. Yum! ← R.I.P. Tastespotting.com! It Was A Love/Hate Relationship, but I’m Gonna Miss Ya.